The Precise 8001 TCOM monitor allows for quick and precise measurement of tcpO2. Due to the 2.5 m long sensor cable - equipped with integrated sensor - an enormous working radius is available. 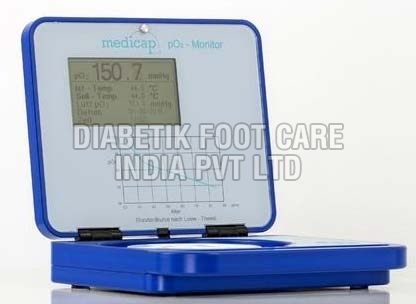 The large LCD display ensures all relevant data are easily read. Priced very attractively for the Indian market. Distributed and serviced exclusively in India. Imported from M/s. Medicap Homecare, Germany. This product is not sold outside India by us and if you wish pl do contact our Principal Company at www.medicap.de.